Today’s oral argument in Bond v. United States was a spirited one, but one that sounded a lot more like a law school lecture than the daytime drama suggested by the facts of the case. (My Plain English preview of the case is available here.) And at the end of that lecture, and despite the government’s fervent defense of the laws at issue in the case as an essential part of the nation’s efforts to combat chemical weapons, including in the ongoing conflict in Syria, it looked like the Court was poised to put real limits on when and how Congress can rely on its power to enter into treaties to then pass laws putting those treaties into effect. Carol Anne Bond was charged with violating federal laws prohibiting the use of chemical weapons when she tried to poison her husband’s mistress. Her lawyer, former Solicitor General Paul Clement, began with the idea that, if the federal laws at issue really do “reach every malicious use of chemicals,” then they exceed the powers given to Congress by the Constitution. The fact that the laws were passed to implement a treaty does not, he said, somehow enlarge Congress’s powers. Clement almost immediately faced skeptical questions from the Court’s more liberal Justices: Justices Ginsburg, Kagan, and Sotomayor. Justice Ginsburg was first out of the gate, expressing her bewilderment that a valid treaty could be constitutional but the legislation to implement the treaty, even if it were substantively the same, would not be. Clement pushed back against Ginsburg’s characterization of the Chemical Weapons Convention and the laws at issue in this case as similar, reminding her that there was one “very important difference”: the Convention “doesn’t directly regulate individual conduct at all,” which of course the federal laws do. Justice Kagan, meanwhile, pressed Clement to identify any limits in the Constitution on the federal government’s power to enter into treaties. Clement emphasized that the federal government did not need to enact laws regulating individual conduct to put the treaty into effect in the United States because state laws could do so. In response, Ginsburg observed that, in this case, victim Myrlinda Haynes had gone to state and local law enforcement for help but had been “turned . . . away a dozen times”: it was only when the U.S. Postal Service took over the case that Bond was apprehended. During his argument, Clement reminded the Court that the chemicals at issue in Bond’s case were “perfectly lawful” until they were used in a malicious way. That, he explained, distinguished them from fundamentally dangerous chemicals like sarin gas, which would be covered by the Convention even when used in a domestic dispute. But that approach got him into hot water with Justice Sotomayor, who countered that similar examples can be found in all kinds of criminal laws – for example, a car isn’t an inherently “dangerous weapon,” but can be when it is used as one. It was more important, Clement continued, that Bond’s case does not present the kind of “warlike” conduct that the Convention was intended to target. 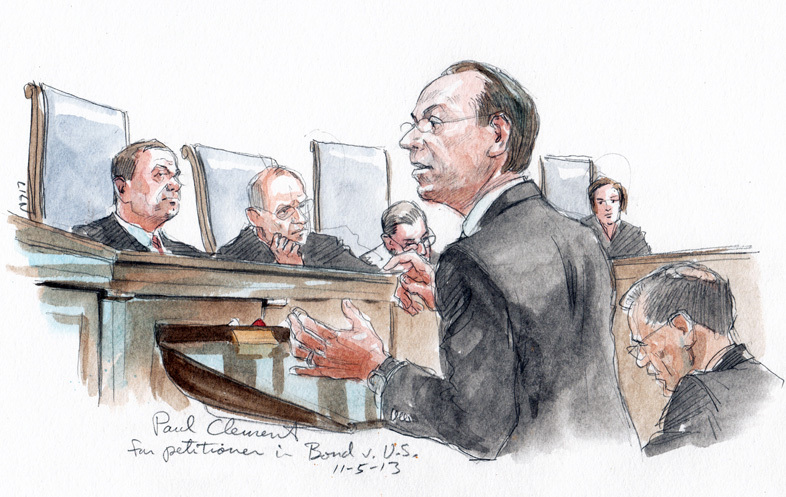 Although Clement faced a near-constant barrage of questions, virtually all of the hostile questions came from only three Justices. Solicitor General Don Verrilli, on the other hand, faced an even tougher audience when he rose to defend the statute and Congress’s power to adopt it. He began by reiterating a point from the government’s brief: the Framers had given the federal government “exclusive control” over the treaty power so that it could “knit” the country together in its earliest days. But the Chief Justice several times pushed Verrilli to identify the limits on the government’s treaty power, asking him whether Congress could pass, based on a multilateral treaty, laws giving the federal government authority to prosecute “purely local crimes.” Verrilli tried to deflect the question on the ground that it would be “unimaginable” for the Senate to pass such a treaty, but that answer prompted Justice Kennedy to quip that it would also seem “unimaginable” for the federal government to prosecute a case like this one in the first place as a federal felony. Justices Scalia and Alito also appeared unreceptive to Verrilli’s arguments. Justice Scalia was unconvinced by Verrilli’s contention that, if a self-executing treaty (that is, an agreement that becomes part of federal law as soon as the Senate approves it) can impose an obligation on the states, a non-self-executing treaty (which requires additional action by Congress) can do the same. Justice Alito, meanwhile, lamented that the federal laws implementing the Convention are “very broad” and suggested that he and his wife may have themselves violated federal laws by giving “toxic chemicals” – in the form of chocolate, which is toxic to dogs – to trick-or-treaters last week. But perhaps most significantly, Verrilli (unlike Clement) also was on the receiving end of tough questions from one of the more liberal Justices, Justice Breyer. As he frequently does in high-profile cases, Breyer focused on a possible middle ground: the Court might be able to resolve the case by drawing a line that would include genuine chemical weapons within the scope of the federal statute but leave out things that are clearly not “chemical weapons” – such as, he suggested, a poisoned potato or the performance-enhancing drugs allegedly used by cycling great Lance Armstrong. Verrilli was not willing, however, to give an inch here, reminding the Court of the U.S.’s ongoing role in the conflict in Syria. He cautioned the Court that there is a “real risk” if courts were to get involved in interpreting the Convention and its implementing laws and try to draw a line when, he argued, the drafters of the Convention purposely made it broad because they couldn’t anticipate in advance all of the ways in which chemicals might be used as weapons. With the usual disclaimer that oral arguments aren’t a perfect predictor of how the Court might rule, Bond and her lawyers can be optimistic after today’s oral argument; the government only seemed to have three solid votes in its favor, and it’s hard to see where two more might come from. If that’s the case, then the real question may be how – and how big – she wins. No matter what happens, we’ll be back to cover it in Plain English.